Handyscope HS6 DIFF - 1000XMESG, the EMI pre compliance tester. 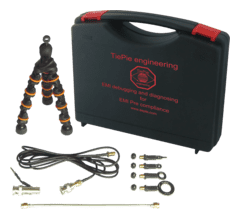 TiePie engineering introduces the Handyscope HS6 DIFF - 1000XMESG EMI analyzer. The powerful capabilities of the Handyscope HS6 DIFF - 1000XMESG EMI analyzer give the user the possibility to quickly perform a good EMI compliance test. With this cost effective test, time and money are saved by avoiding extra visits to expensive EMC testing facilities. The supplied EMI probe set TP-EMI-HS6 contains three magnetic field (H field) probes and one electric field (E field) probe. The tripod ensures that the probes can be positioned properly at the object under test. The Handyscope HS6 DIFF - 1000XMESG EMI analyzer consists of a Handyscope HS6 DIFF - 1000 with option E installed. Option E also includes the EMI probe set TP-EMI-HS6. The EMI probe set TP-EMI-HS6 is a complete set of probes, conveniently packed in a carry case. The set contains three differently sized H field probes and an E field probe. The Handyscope HS6 DIFF - 1000XMESG EMI analyzer is the ideal instrument to perform your EMC / EMI pre compliance tests.